I was looking online the other day for a CSA or CO-OP program in our area. I found one at LOCAL HARVEST , and will start receiving goodies in a few weeks. 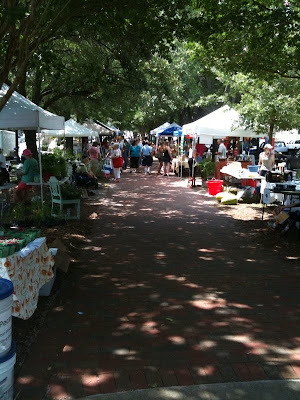 I also found out from looking at LOCAL HARVEST about a Saturday market in my town. 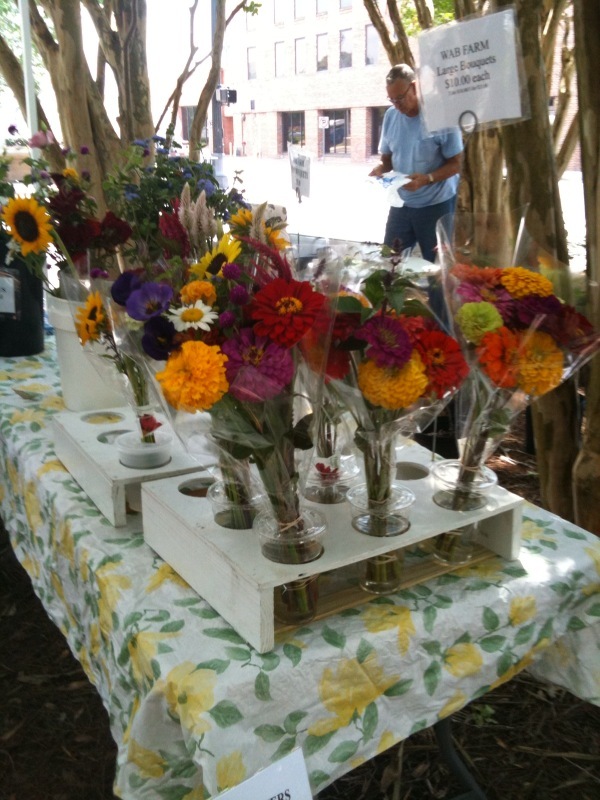 PALAFOX MARKET is located in downtown Pensacola smack dab in the middle of Palafox Street. So today I headed downtown to check it out. 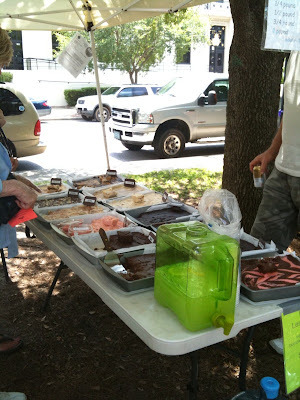 There were local (everything has to be grown or made within 100 miles of the market location) farmers, some in the CSA and CO-OP program, artists, jewelry makers, bakers and fudge makers.....YUMMY! Honey and milk and honey soaps. Fresh cut flowers, she says they sell out every Saturday. And here's that FUDGE and fresh lemonade. I talked to the manager of the market, Hillary from the Downtown Improvement board, about being a vendor. And do you know what she told me???? All you have to do is go online and fill out the application, tell them what kind of items you plan to sell and what Saturdays you would like to set up. 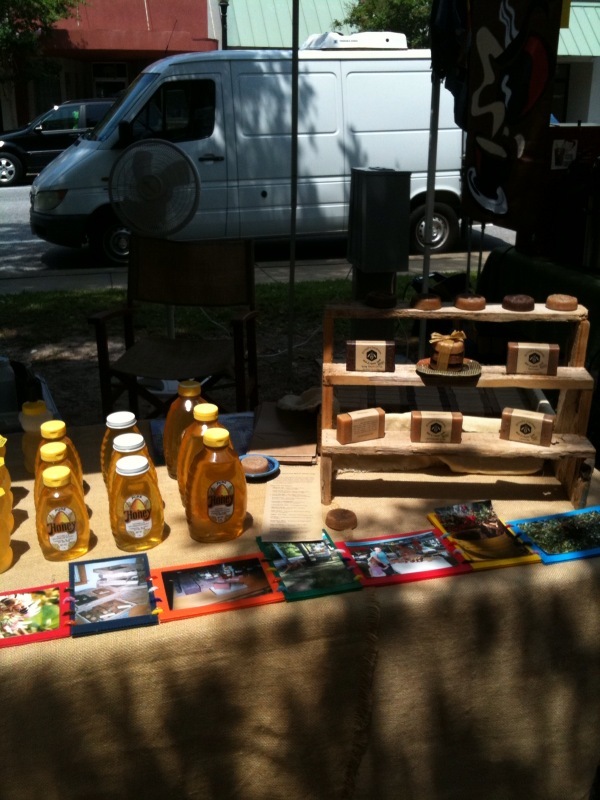 Everything you sell has to come directly from you, grown, handmade, etc. I thought it would be a great outlet for mine and the HUBBY'S folk art and repurposed items. So I have filled out the application and need to take a few photos and will head back downtown Monday morning to turn it in. I talked to alot of the vendors, brought home a handfull of business cards, a yummy piece of Greek pastry and a bag full of okra and green tomatoes. Did I tell you I LOVE FRIED GREEN TOMATOES?! And a wish list of what I want to get at next Saturday's market. This sounds like so much fun~ what a great market! Thanks for stopping by and following my blog! I've really enjoyed my visit to yours, too...I am a new follower! Just found your lovely blog...so glad I stopped by. I look forward to following along with you on life's many adventures!! !